I finally downloaded a bunch of photos off my dSLR memory card onto my main desktop. I haven’t done so for over three months, which is a new and entirely undesirable record for me. 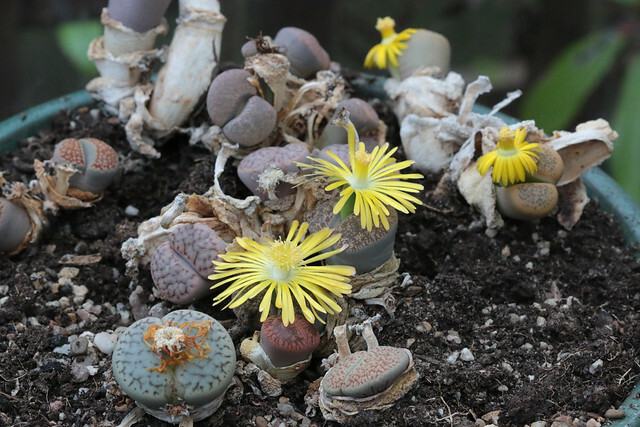 I found this photo of the lithops in bloom from early September. The bloke gave me this tray of “living stones” eight years ago. It started blooming regularly when we moved to Worcestershire and it went to live in the conservatory, where it gets plenty of light and we often forget to water it (which is exactly what it likes). Yes! Also, they often make tiny seed pods, and then you get itty bitty lithops popping up in the soil around them in spring. Only a very few seem to survive, though. Cool! I don't think I've ever seen them flower before. Yes, the conservatory's conditions (sheltered and dry, plenty of light, very hot in the summer) are the only ones that I've seen cause them to flower. Yes, and tiny! The surrounding soil needs a bit of a tidy but it will probably wait until spring.